The U.S. Department of Defense (DoD) spends an estimated $14 billion or more per year on “synthetic” digital training — training that uses digital environments to teach and prepare personnel for real-life jobs and experiences. Continual advances in U.S. military systems — from Air Force fighter jets to Navy Littoral Combat Ships to Army cyber defense — make it imperative that military personnel stay up to date with the latest changes in hardware, software and related systems. The challenge: Pulling personnel out of the field for training is costly, time-consuming and often not possible during prolonged engagements. And it’s nearly impossible to keep up with changes for so many systems and procedures. Meeting that challenge is one reason the Pentagon is reportedly looking to budget as much as $11 billion for virtual, augmented and mixed reality training systems by 2022. Virtual reality (VR), which immerses the user in a life-like virtual environment, and augmented reality (AR), which enhances real-world views with extrasensory features such as sound, touch and visual effects, are enabling the military to move beyond traditional training simulators while improving the quality of the training itself. Best of all, because VR, AR and mixed reality content is available on mobile devices via the cloud, they make it possible to deliver training to the troops anywhere, anytime, rather than requiring troops to travel to training centers. These platforms are already making it easier to develop a wider range of training materials, providing hands-on learning for new recruits as well as career personnel needing to upgrade their skill sets. Used in tandem with computer games, simulators and live training, immersive technologies can not only accelerate experiential learning, effectively preparing today’s tech-savvy generations for real-life situations, they also are aiding recovery from psychological trauma for those returning from the field of conflict. Constructive, in which real people interact with avatars in synthetic environments. The shift toward virtual and constructive training also reflects the increasing array of immersive training courses and scenarios available on demand. That shift is expected to accelerate even more with the adoption of up-and-coming, next-generation high-speed 5G wireless technology. Less Costly: Untethered mobile VR and AR content reduces the down-time and cost associated with pulling trainees away from their stationed base, field or ship and transporting them to training facilities. More Efficient: On-demand training using headgear and sensors means more people can participate when they want to, and training can be delivered more rapidly. More Effective: Digital experiences are how millennials and Generation Y consume information and learn. More Relevant: VR, AR and mixed-reality training, using a blend of VR and AR, allows crews to learn about the vessel, plane, equipment or geography relevant to them. Less Risky: Fully-immersive, 360-degree environments offer combat experiences very similar in many ways to live training, but without the risk. Combined with artificial intelligence technologies that identify individual learning patterns, AR, VR and mixed-reality technologies are taking training to a more efficient and less costly level. Although VR, AR and mixed reality closely mimic real situations, they are not designed as substitutes for actual hands-on and in-the-field training. These technologies are best used as a supplement to live training, and as a way to reduce the need to train on actual equipment or participate in war games with humans. They are also ideal for refresher courses and updates, providing an effective way to access training between more intensive live sessions. Because these technologies offer 3-D immersion — and 4-D when using sensors and touch-responsive haptic gloves — they can actually increase learning more effectively than classroom instruction, simulators and how-to videos. Consider the written manual: Mentally transposing 2-D information onto a physical situation or piece of equipment is already difficult, and the “one-size fits-all” permanency of the written word means the instructions cannot adapt for individual needs or answer questions interactively. The same is true of videos: Although helpful for many tasks, following their instructions requires shifting perceptions from a flat screen to a 3-D object or situation, and they are not interactive. Classroom training requires students to travel to a site, sometimes more than once, costing time and money for students and teachers. Breaking down and repairing equipment can be wearing on the equipment, as well, requiring frequent replacements. And if specific equipment is unavailable for training, students may need additional instruction on the job. All of these factors add up dramatically in terms of cost at a time when every agency remains under intense pressure to reduce expenses. Like many new technologies, VR and AR hardware and software are still under development. Until recently, the relatively high cost of equipment and limited battery life has hampered wider adoption. That’s changing, however, as companies like Samsung are developing more-affordable devices like their Gear VR headset. 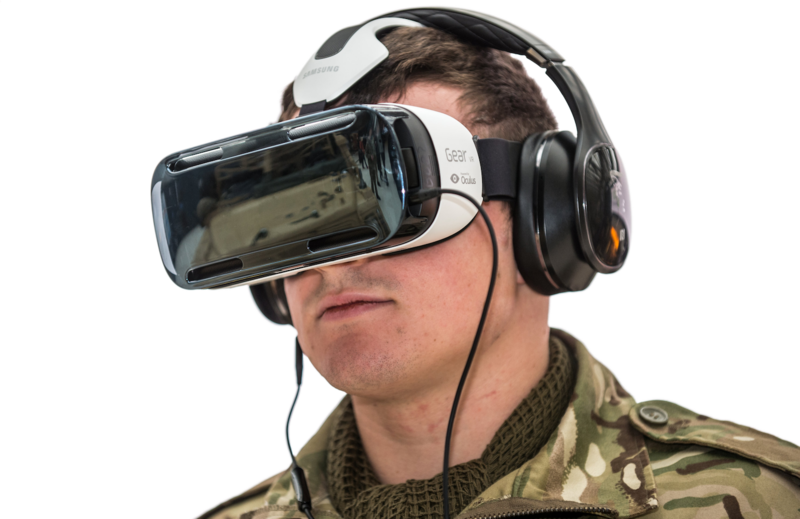 As more military personnel are issued mobile devices, these consumer VR technologies offer a logical extension of existing mobile initiatives in the DoD. Provisioning one of these headsets at a nominal cost gives troops flexible and secure access to a wealth of training material. Securing these devices, and the access they provide to potentially sensitive training material, is a growing concern for many military simulation and training experts. Manufacturers like Samsung are addressing these concerns by incorporating military-grade security measures, such as their DoD-approved Knox security platform, into mobile devices and headsets. The Samsung Knox platform, together with supporting mobile management tools, ensures that training content is secure and not misused. Knox’s data separation solutions, like Knox Workspace, can be used to ensure training apps on mobile devices are protected within a secure, managed container. Gear VR training devices can also be customized using Knox Configure to ensure they are only used for their intended purpose. Another challenge facing the DoD will be the investment required to produce valuable VR training content. Fortunately, new solutions are hitting the market that will make it easier to capture and produce high-quality content. Cameras like the Samsung 360 Round, when combined with a growing number of available tools and software, will empower a larger network of creators to produce and share new high quality content quickly and securely as training needs emerge and evolve. As the barriers to VR and AR come down, defense training experts are witnessing the rise of immersive training. Meanwhile, agencies, led by the DoD, are discovering applications beyond training for VR and AR. U.S. treatment centers are beginning to offer VR therapy for sufferers of post-traumatic stress disorder (PTSD). Medical professionals are finding the technology useful for retraining traumatized minds. Dr. David Rhew, chief medical officer at Samsung, for instance, is exploring the power of VR and AR to help PTSD sufferers as well as those with depression and related maladies. As uses for VR and AR multiply, so will the demand for devices and content — much as mobile apps propelled the growth of smartphones and tablets. As millennials and Generation Y embrace these technologies, it’s only a matter of time before employers including the federal government will find VR and AR technology an essential tool for training and retaining valued personnel. Find out more how Samsung is helping the Department of Defense and other federal agencies accelerate their training capabilities through immersive technologies. *This article was produced by FedScoop for, and sponsored by, Samsung.